Amid a decline of 4.6 percent in worldwide PC sales, Apple’s Mac sales were also down 2.5 percent in the first quarter of 2019, according to new PC shipment estimates shared this afternoon by Gartner. 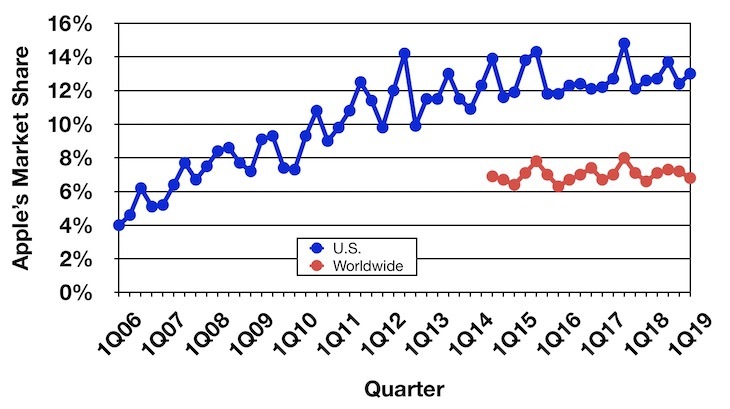 Apple shipped an estimated 3.98 million Macs during the quarter, down from 4.08 million in the year-ago quarter. Apple’s market share grew year-over-year though, coming in at 6.8 percent, up from 6.6 percent in Q1 2018. Apple continues to be ranked as the number four PC vendor worldwide, coming in after Lenovo, HP, and Dell, but ahead of Asus and Acer. Apple also held the number four spot in the year-ago quarter. Lenovo, HP, and Dell all saw shipments grow or remain steady, while Asus and Acer, like Apple, experienced declines. Lenovo, the number one worldwide PC vendor during the quarter, shipped 13.2 million PCs for 22.5 percent market share, while HP, a close second, shipped 12.8 million PCs for 21.9 percent market share. Dell came in third with close to 10 million PCs shipped and 17.6 percent market share, while Asus and Acer brought up the rear with 3.6 and 3.2 million PC shipments, respectively. Overall, there were an estimated 58.5 million PCs shipped in Q1 2019, down from 61.4 million in the year-ago quarter. Apple’s U.S. Mac shipments also declined, with Apple shipping an estimated 1.44 million Macs during the quarter, a 3.5 percent decline from the 1.5 million Macs it shipped in Q1 2018. Apple is ranked as the number four vendor in the United States, trailing behind HP, Dell, and Lenovo, but beating out Microsoft. HP was the top U.S. PC vendor with 3.24 million PC shipments, followed by Dell with 3.16 million and Lenovo with 1.5 million. The overall PC market in the United States saw a 6.3 percent decline compared to Q1 2018, with a total of 11 million PCs shipped. IDC also released its shipment estimates this afternoon, and is often the case, IDC’s shipping estimates are different than Gartner’s due to the variations in the way each firm makes shipment calculations. IDC also suggests that overall worldwide PC shipments declined, but by just 3 percent with a total of 58.48 million PCs shipped during the quarter. Apple is also the number four worldwide PC vendor in IDC’s estimates, with IDC suggesting Apple shipped an estimated 4.058 million Macs during the quarter, a mere 0.5 percent drop from the 4.078 million Macs shipped in the year-ago quarter. Data from Gartner and IDC is based on estimates, and while Apple used to provide specific breakdowns of Mac sales, the company is no longer doing so and there will be no way to confirm shipment estimates going forward. These new numbers follow refreshes of both the MacBook Pro and the MacBook Airlineups, both of which were overhauled in October 2018, but come prior to the launch of updated iMacs. Apple this year has several additional Mac updates on the horizon, including a new high-end high-throughput modular Mac Pro. Apple’s Mac sales could potentially be suffering due to the negative publicity surrounding the butterfly keyboard issues in the MacBook, MacBook Air, and MacBook Pro, a problem that has become increasingly visible due to its impact on even the newest Mac notebooks.